The gluten-free baking ventures continue! We were recently invited to a Christmas party that required everyone to bring a dish. I've never brought a dish to a potluck as married woman, so I wanted to bring a little more of a sophisticated dessert. My best friend turned me on to the white chocolate/raspberry duo and I thought it was the perfect taste to take to a holiday party! But as they say, you should never take something to a party you haven't made before. But to that I said whatever as I usually stick to the basic chocolate cookie. Is this too much back story for a recipe? Probably. Anyway. The cookies turned out greeeaaat. At least I liked 'em. And so did a couple other people. I've been asked for the recipe a few times, so I thought I'd write a post on them. The original recipe can be found here. I cut the recipe in half and made some changes. I also made them gluten free. 2. Cream cold butter until smooth. 3. Add sugar, vanilla. Cream together. 4. Add eggs. Mix well. 5. Add flour, cocoa, salt, baking soda. Combine. 6. Stir in chocolate and white chocolate chips. 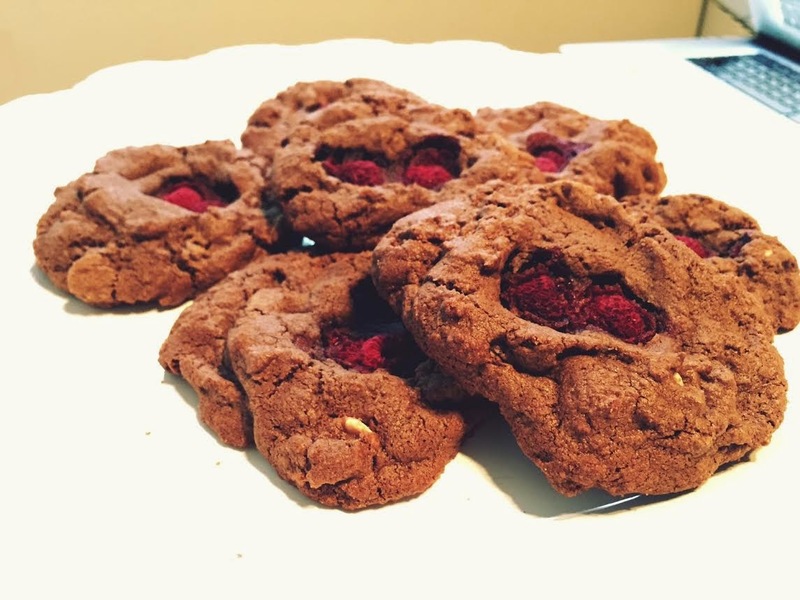 *I made the original recipe where the raspberries are mixed into the dough, but I had some trouble with the cookies sticking to the cookie sheet. My husband had the idea of taking a teaspoon, pushing a little divot into the balls of dough and place a couple frozen raspberries in the middle of the balls of dough. They turned out great!